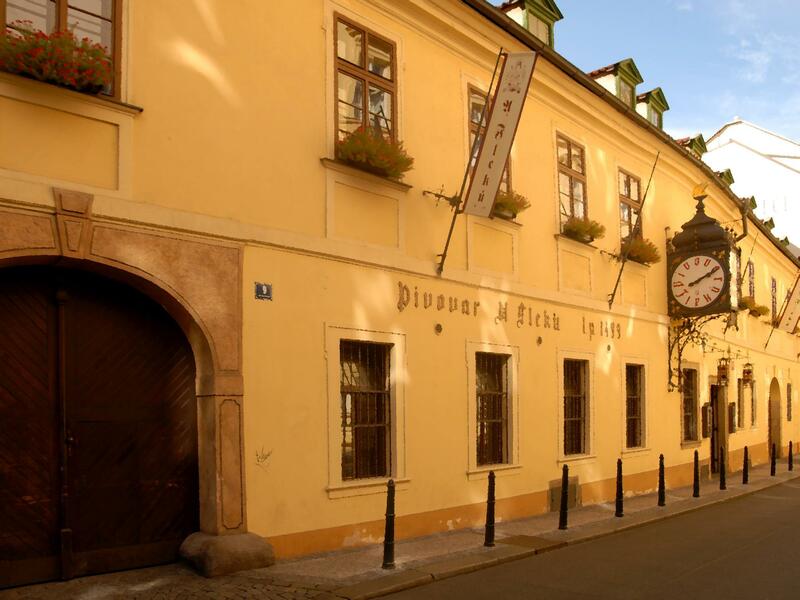 The brewery museum was opened in the former malt-house to mark the 500th anniversary of the U Fleků brewery. 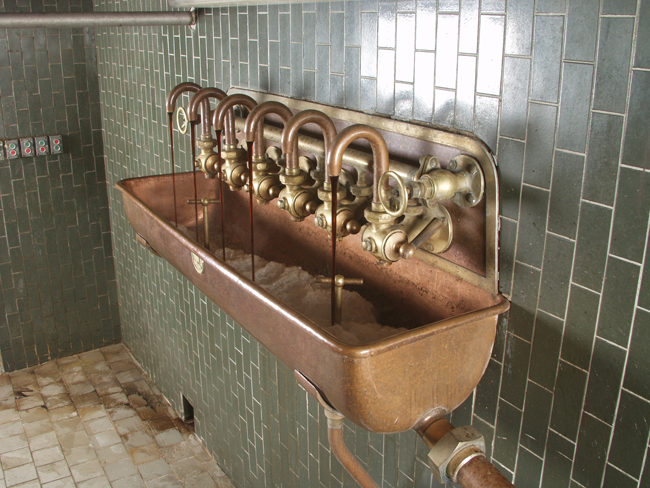 The exhibition created in 1999 enhances the one-of-a-kind atmosphere on the brewery premises. Located in the renovated exhibition spaces are examples of brewing machines, tools and vessels that inform the visitor about the ancient history of beer production in Prague. Tours take place only on request and the number of visitors is limited (max. 15 persons.) On Saturday tours must include a meal in the restaurant. Beer has been brewed in our territory since long ago. At the end of the 10th century, brewing and drinking beer was banned by Bishop Vojtěch, but this ban was not very much kept. The ban was abolished in the 13th century by the pope, upon requests from king Václav I. In the era of Charles IV, for example, there were 36 burgess breweries, and beer was brewed in monasteries, perhaps also at the university, and there were beer battles being held: beer from Malá Strana as opposed to the New and the Old Town beer; beer from Rakovník as opposed to Prague beer. Competition was tremendous. 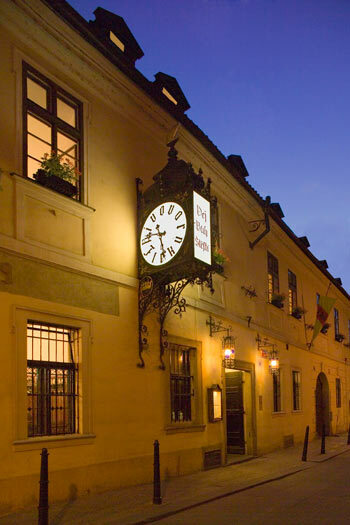 U Fleků is one of the most popular and very old breweries. It is a constructional unit in place of one Gothic and two Renaissance houses, the remains of which are preserved below the terrain. Its tradition dates back to the 15th century, and it might be even older according to the remains of Gothic walls, in which malt was dried and roasted. The brewery was established a little later. 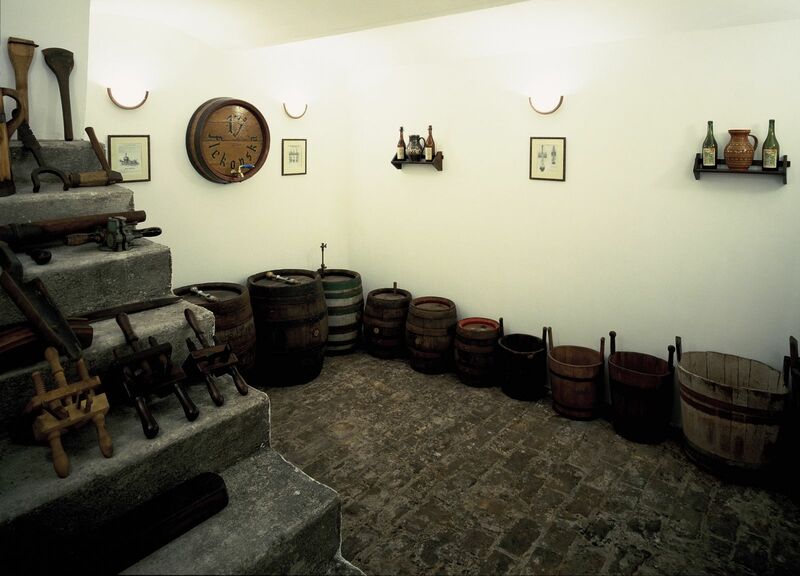 The first reference to beer brewed in this place is from 1499, when the house was purchased by Vít Skřemenec. After him, the house was managed for a long time by madam Ludmila, who was called Skřemenecká, despite being married several times. The family of Skřemenec or Křemenec managed the brewery for a very long time. After the Battle of Bílá Hora, the owner emigrated, and the house became desolate; even beer stopped being brewed. The contemporary records state “wasteland at Křemenec”. After 1637, brewing beer was restored, and despite changing owners of different names, the house was still called At Skřemenec, which lasted until 1762, when the house was purchased by Jakub Flekovský, a brewer from Počernice. It was namely his son Štěpán, who became popular among Prague brewers and had merit in the golden era of the U Fleků brewery. In 1807, the brewery was owned by František Pštross, former Prague mayor, who purchased the neighbouring land plot and kept cultivating the entire premises, which already back then reached today’s proportions. In 1843, he started to brew dark lager in a Bavarian way; before that, only light beer had been brewed here. The last owner was brewer Václav Brtník, who died in 1937. After World War II, the brewery was nationalized. In the 90s, it was returned to the heirs. Thirteen-degree black lager is brewed in a hundred-year-old device, in a way that is about two hundred years old. The actual production lasts for six weeks. 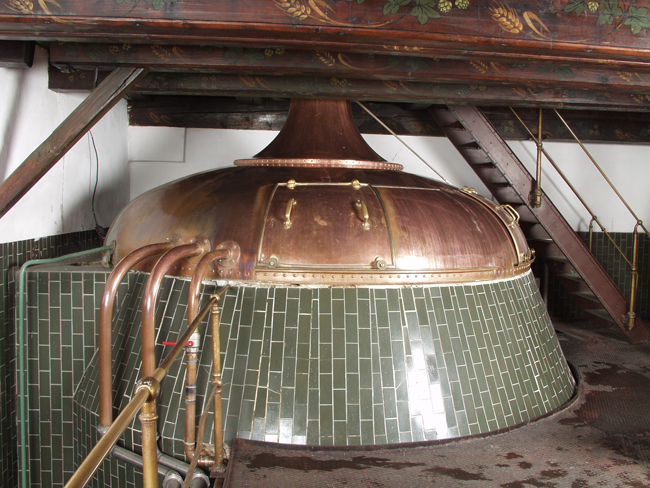 Among the jewels of the brewery, there is, for example, a cooking room with original wooden ceiling from 1360. One brew is made with twelve quintals of malt and twelve kilograms of hop. The malt, sprouted barley, used to be made in the local malt house, which terminated its operation in 1940. Different types of delivered malt are only ground here, half being light from Plzeň, 30 % darker from Bavaria, 15 % toffee and 5 % dark roasted, which adds colour to the beer. After brewing, the future beer goes to a large cooling stock, where it cools down. This is where the “flekovská třináctka” comes to existence for the first time. 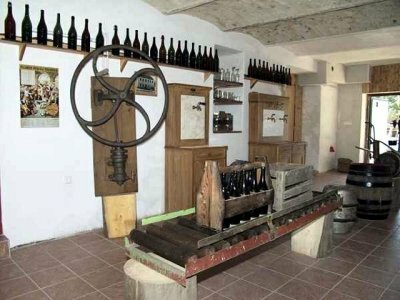 It is then discharged to the cellar, where the main fermentation takes place in a temperature of 5 - 10 degrees Celsius. Fermentation lasts for 13 days, which means one degree per day. Then the beer is let in barrels, which are made of aluminium nowadays, where it remains for one month. Here it ferments to the right taste. Approximately 6000 hectolitres of beer are brewed per year; the beer contains 4.1 % of alcohol and is consumed here in the restaurant. The beer made U Fleků is today practically the only one that is made with classical brewery technology, is self-malted, fermented and unfiltered, which means it only contains malt, water and hop. The brewery equipment is a technical monument. The interior equipment in a Romantic style dating back to 1898 is historicising; it was designed by architect František Sander. There are wooden ceilings, rib vaults, inlaid windows in colour. 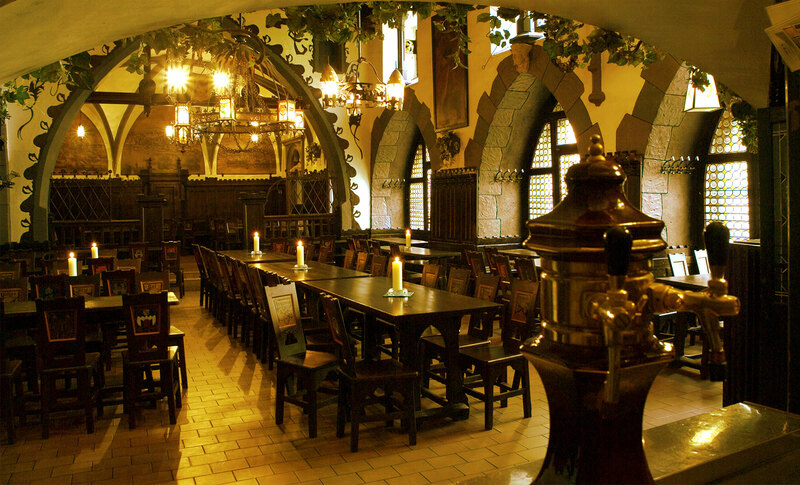 There are several lounges and halls in the catering premises U Fleků: the Knights’ Hall, formerly called Emauze, with antique chairs with coats of arms of Czech towns with breweries. There is a 250-year-old historical clock and there are paintings by prominent Czech painters. In the front part, there is a people’s dining lounge called Old Bohemian; further on, there is a classical alehouse called the Large Hall, and a smaller Trunk, where the journalists used to go. The most famous lounge is called Academia, and years ago, the so called academicians used to meet here, being painters, writers, architects and other people of similar thinking. Láďa Novák, a contemporary of Mikoláš Aleš, together with Jindřich and Ota Bubeníček and Vilém Trsek decorated the alehouse U Fleků with paintings and inscriptions glorifying beer. Novák’s painting named St. George fighting a dragon was a dominant of the brewery yard. Further on, there was a painting King Ječmínek’s procession, and there were paintings in the yard pillars’ arches. The owner back then, brewer Khop was so happy to have such beautiful decorations, that he reserved one individual lounge to be used by the artists. The head of their association was Láďa Novák, who was crowned as „the king U Fleků and the king of fun and laughter” in 1908. The artists sometimes staged amateur performances, and a cabaret was also present here. It is possible to get to other lounges, named Václavka and Jitrnice (white pork sausage), over the yard and the garden, and from here past the tap-room and the kitchen into the lounge named Hop-Garden, the seat of the cabaret, which returned into this place in 1965. Throughout summer, the brewery with the garden can hold up to 1,000 visitors. To name a few important persons visiting the brewery, besides the already mentioned painters, there were writers Josef Kajetán Tyl, Jakub Arbes, Jan Neruda, Jaroslav Hašek, painter Viktor Oliva and sculptor František Rous, also actors Jindřich Mošna, František Ferdinand Šamberk, Rudolf Deyl senior, Karel Hašler, Zdeněk Štěpánek and others. There were also fancy personalities coming here to earn a living, such as a match seller named Ferda-matches-Europe, or Antonín Fiala, weather prophet, and others. During the 80s, the brewery went through a total reconstruction. At present, its current operation is focused on tourism. Since 1998, this brewery has its own museum with a brewery exposition. The museum was opened to commemorate the 500th anniversary of the brewery and the end of World War I, when the soldiers returned back to the pubs. The museum is located in the former malt house, which was in operation from 1600 to 1940. There is a preserved roof smoke kiln, where the malt was dried, and later also roasted in the hot smoke from beech logs. There is a filter for beer filtration, a shower cooler or a compressor for pressurizing beer with air. There are two-hectolitre wooden barrels decorated with branding irons, as well as tools for their processing, there is a bottle filler, malt weighing machine, densimeters, and much more. There is also a waggoner exposition with a model of a waggon which used to be pulled by geldings.